Playwright David Hare, author Monica Ali, comedian Shazia Mirza, MP Keir Starmer and Nobel laureate Wole Soyinka are among those who have written to Prime Minister Theresa May asking the UK government to call on Bahrain to release a campaigner imprisoned for just tweeting his opinions. 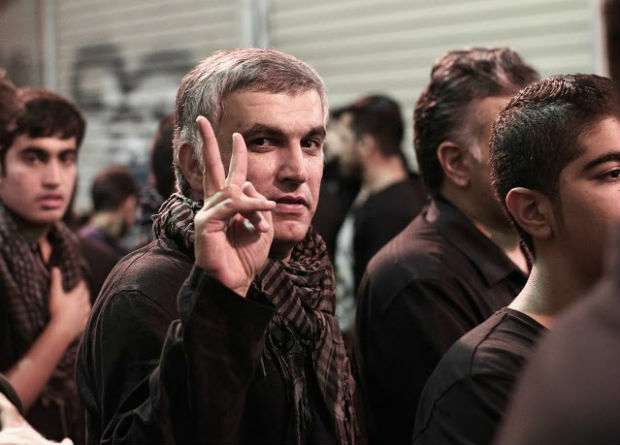 Nabeel Rajab has been in pre-trial detention in Bahrain since July. He has been held largely in solitary confinement, and for the first two weeks after his arrest was held in a filthy police cell that aggravated heart and other health issues. Rajab was arrested for expressing opinions. He did not advocate or condone violence, nor is he accused of any violent act. Some of the “criminal” communications he is charged with include retweets of his support for organisations like Index on Censorship, which organised the letter. Rajab is also accused of “insulting“ Bahrain’s ally Saudi Arabia. He faces up to 15 years in prison for his “crimes”. Rajab is a former winner and judge of the Index on Censorship Freedom of Expression Awards and those who signed the letter included former fellow winners and judges. We are writing to ask you to call publicly for the release of Nabeel Rajab. One of the Gulf region’s best-known human rights defenders, Mr Rajab has been in pre-trial detention since July. He has been held largely in solitary confinement, and for the first 15 days after his arrest on 13 June was held in a filthy police cell that aggravated heart and other health issues. Mr Rajab was arrested simply for expressing opinions. He did not advocate or condone violence, nor is he accused of any violent act. Indeed, some of the “criminal” communications he is charged with include retweets in his support from international civil rights organisations like Index on Censorship. He is also accused of “insulting” Bahrain’s ally Saudi Arabia. He faces up to 15 years in prison for his “crimes”. Free expression is under severe threat in Bahrain and the region. It is vital that Bahrain’s democratic allies make clear to Bahraini authorities that their behaviour is unacceptable. The US State Department has already publicly called for Nabeel’s release. We ask Britain to do the same. I support and second this letter.